Sweet Pete’s is known far and wide to be one of the most fun and unique places in town. With its relocation to the historic Seminole Club building on Hogan Street in 2014, Sweet Pete’s became one of the largest candy stores in the country. It is also one of the most beloved. The Candy Apple Café opened in December of 2014 and has quickly become a popular dining destination in town, and for good reason. 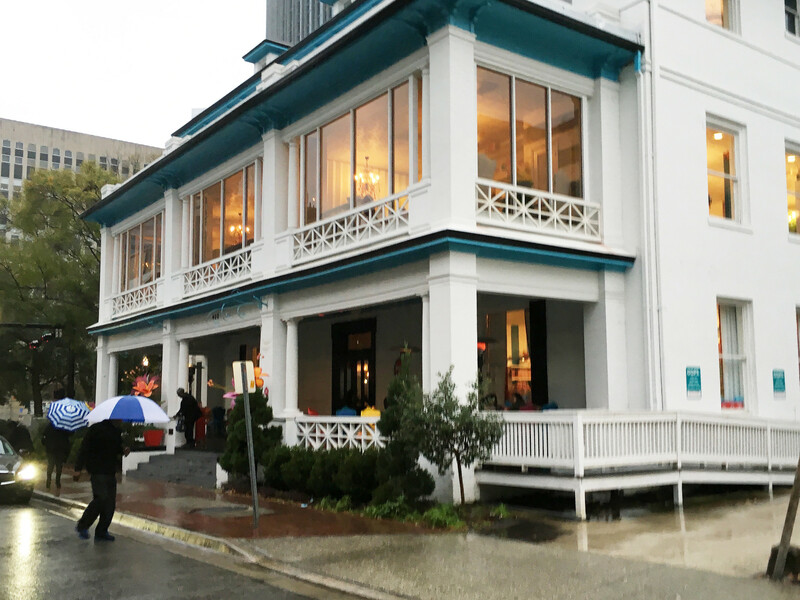 The Candy Apple Café is situated on the bottom floor of the building, to the left as you enter off of the front porch. Walking into the café is like stepping back in time. The decor is bright and whimsical and has a distinct vintage feel to it. The bold blue colors contrast against black and white accents to give the space a classic, chic look while the fun artwork and furnishings lend a more playful tone. It’s hard not to smile when you look around and notice all the charming touches – gingham napkins, crystal light fixtures, huge glass cherries, and black and white photos giving a glimpse into the heart of old Jacksonville. The large windows let in plenty of light, making the space feel open and airy, almost like you are sitting outside on a wrap-around porch. The attention to detail is unmatched and the theme is well thought out, making The Candy Apple Café a fun place to just be. Much like the décor, the service is also great. On our most recent visit, our server was polite, attentive, and charming. And he sported a dapper handlebar mustache that, whether intentional or not, went right along with the nostalgic look and feel of the restaurant. We were given menus and took a few minutes to decide what we wanted. The imaginative menu focuses on sophisticated French-inspired Southern fare and boasts a large number of all-day brunch options. We decided to start with a couple of cocktails as well as an appetizer and a cheese plate. Our drinks and starters were brought over promptly and everything looked amazing. My Pop Rockadopolis ($11) cocktail in particular was fun and clever. The glass was brought over with pop rocks in the bottom and while our server poured the cocktail into the glass, the fizzy concoction started popping and turned a lovely shade of pink. This is definitely the coolest drink I’ve had in a while – and one of the tastiest too. The Artisan Cheese Board ($12 for 2 cheese, $4 per additional cheese) went well with our libations and had a good assortment of cheese and accouterments. 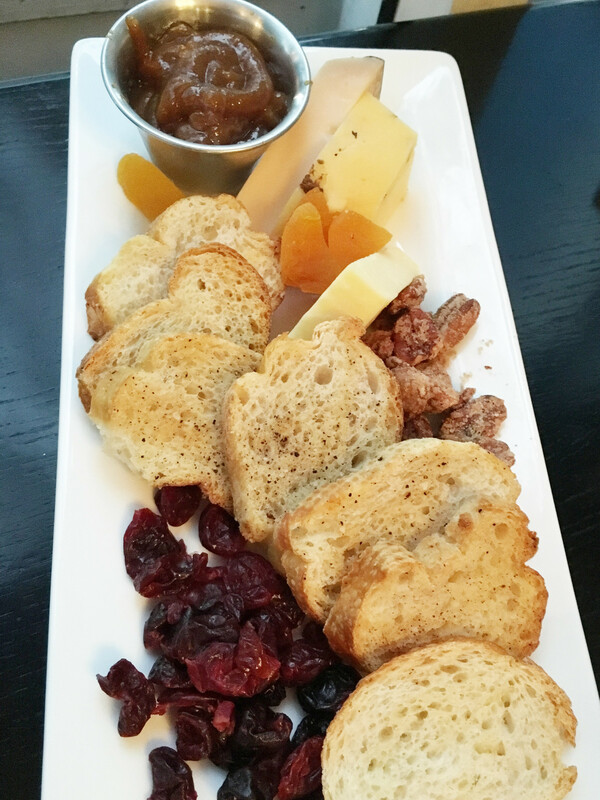 The Irish cheddar, truffle cheddar, and goat cheese were complemented by candied pecans, dried fruit, and crusty crostini. There was also a yummy fig purée that went exceptionally well with the tangy goat cheese. 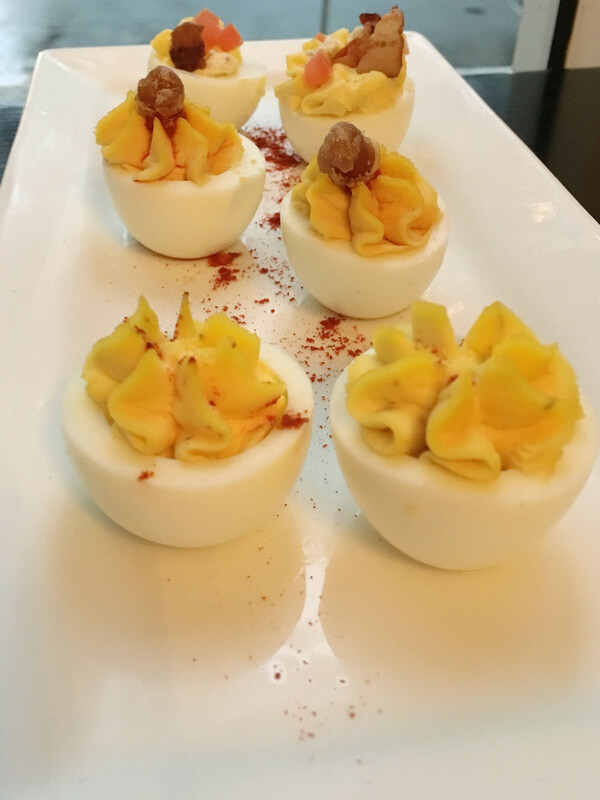 Our Deviled Eggs ($8) were pretty tasty as well. The trio consisted of cobb, spicy hummus, and traditional deviled eggs. The flavorful spicy hummus was our favorite, with the cobb coming in a close second. The only drawback with these eggs was that one of mine had a tiny piece of eggshell still on the bottom – just an oversight I’m sure, but still pretty unappetizing to bite into. Next up were our entrées, which also arrived quickly. Given that it was a Saturday night and they were fairly busy, we were impressed with how prompt the service was. It is easy to see that the The Candy Apple Café kitchen really has their act together. 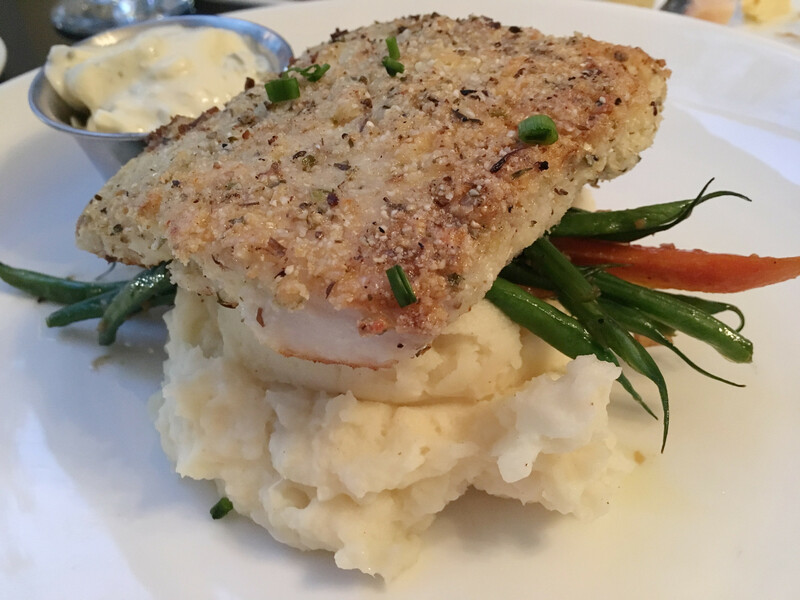 For my entrée, I went with the Cornmeal Dusted Flounder ($17), which was cooked perfectly and seasoned really well. The fish was light and flaky and the cornmeal gave it just the right crunchiness. The brown butter whipped potatoes were also good – creamy, light, and buttery. But the star of the plate was the assortment of petite vegetables layered between the fish and the potatoes. Too often, vegetables that accompany an entrée can seem like an afterthought with little flavor. These tender carrots and green beans were just the opposite. I could have eaten a whole plate of these perfectly seasoned veggies. My husband also enjoyed his entrée. 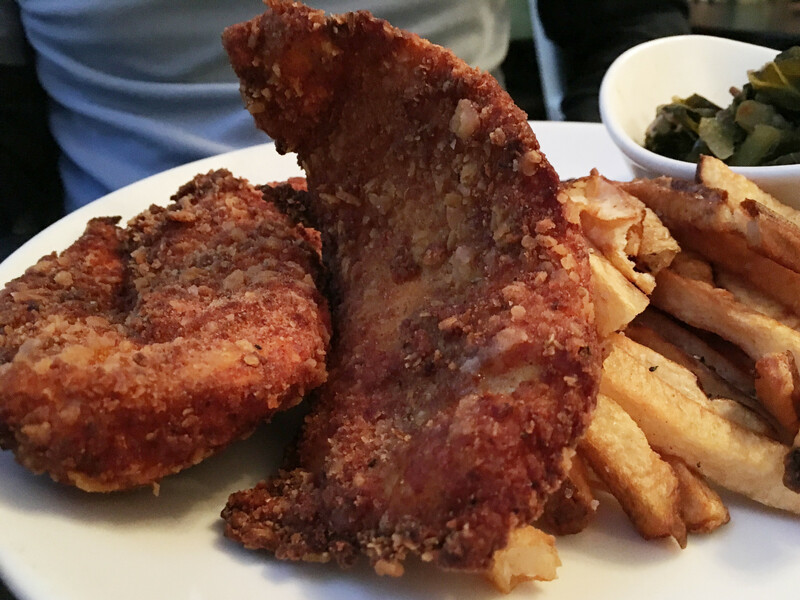 He went with the Buttermilk Fried Chicken ($15) and was not disappointed. The two large chicken cutlets were incredibly crispy on the outside, but still juicy and tender inside. And they were packed with flavor. The delicious pink peppercorn gravy served alongside the chicken added even more flavor, along with a comforting sense of Southern home cooking. There were also house fries, which were good, although nothing really special. The collard greens, on the other hand, were very special. 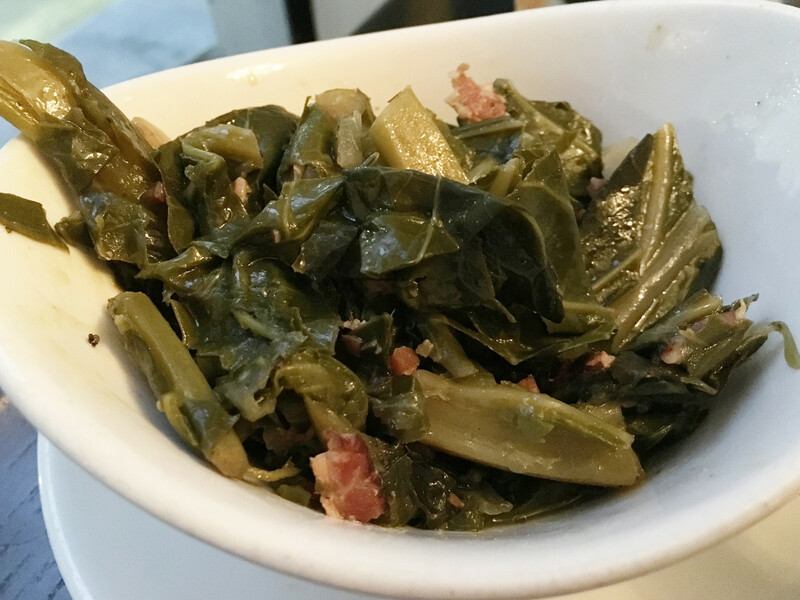 I am not a big fan of collard greens because of the bitterness that can sometimes go along with them. These greens won me over. They were vinegary, smoky, and full of flavor, without even a hint of bitterness. I loved these greens and will definitely be ordering them on our next visit. Even though we were stuffed, we powered through and ordered a dessert to cap off our meal. The signature gourmet candy apples sounded amazing, but we decided to go with the Chocolate Almond Dacquoise Torte ($9). As soon as we dug in, we knew we had made the right choice. It was a dense, rich, and flavorful torte. The almond flavor was subtle and not too sweet while the decadent dark chocolate and the rich espresso buttercream stole the show. 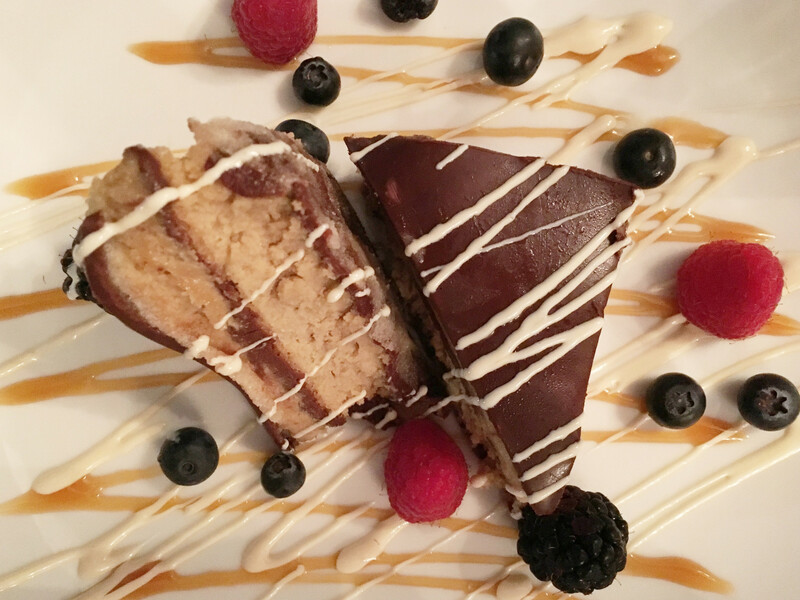 Fresh berries scattered across the plate were the perfect thing to complement this dessert. Given the price and the incredible taste, this dessert was fantastic. And there was a lot of it…more than enough for two people to share. After our meal we strolled around the expansive candy store, discovering all sorts of crazy sweet treats as we went. It was a great way to wrap up our dinner experience. And “experience” is really the perfect word to describe the The Candy Apple Café. The food was playful, upscale, and comforting, much like the decor. But between the impeccable service and the festive atmosphere, the experience is clearly the focus here. Don’t get me wrong, the food was delicious and we will certainly keep coming back to eat it. But the food does seem to take a bit of a back seat to the experience as a whole. 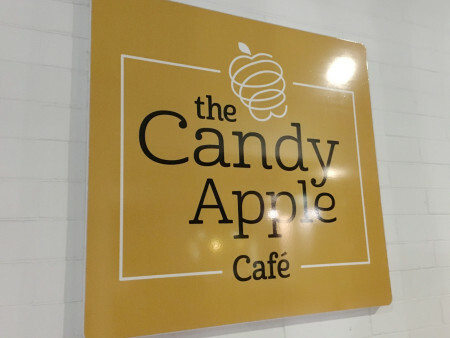 The Candy Apple Café is the perfect place to bring out-of-towners for a crash course in Jacksonville culture or to celebrate a special occasion (in the hour or so we were there, we heard “Happy Birthday” sung at least three times). It is also a great place to celebrate the hours between 3pm and 7pm Tuesday through Friday, since their happy hour specials are pretty amazing. 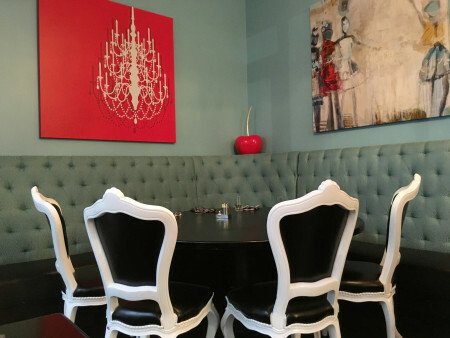 This makes the The Candy Apple Café a great place to unwind and catch up with friends over a cocktail and some amazing appetizers. But The Candy Apple Café is also uniquely family friendly. Between the fun atmosphere and well, the candy, this is a great place to bring the family. Their new Parents’ Night Out program makes it an even better place. Every second and fourth Tuesday of the month, parents can drop off their kids upstairs with licensed childcare professionals and then head back downstairs to enjoy a kid-free dinner. The kids will enjoy crafts, fun, and a dinner of their own while the grown-ups can enjoy some adult conversation and the joy of eating a meal in peace. Check out their website for all the details. Overall, the The Candy Apple Café is just outstanding on so many levels. 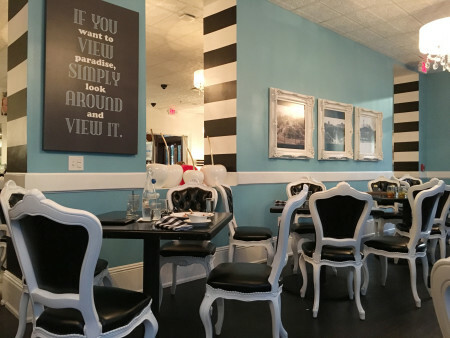 We would definitely recommend checking it out at least once, if not just to say you’ve experienced eating a delicious upscale meal in one of the nation’s largest and most unique candy stores. The Candy Apple Café slogan is “Come for the sweet and stay for savory.” We would venture to say that an equally suitable slogan would be “Come for the food and stay for the party.” Dining at The Candy Apple Café is definitely a one-of-a-kind experience that is sure to please. 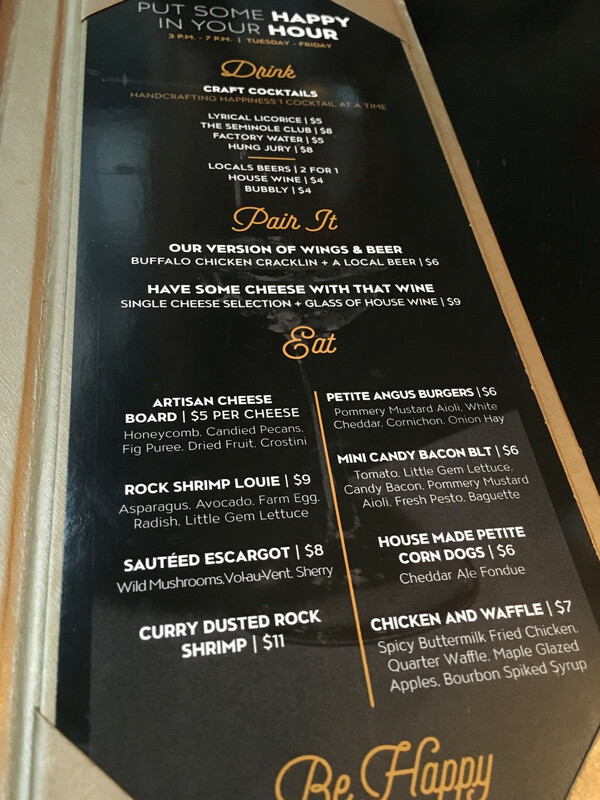 Tagged Brunch, cocktails, Dessert, Dinner, French, Full Bar, happy hour, lunch, Southern Cuisine, Takes Reservations, Vegetarian Friendly. Bookmark the permalink.